Suzuki Philippines (SPH) posted a record-breaking 37 percent year-on-year (YoY) growth as they wrapped up a fruitful year marked by product launches, dealership inaugurations, and events which have brought the products closet to Filipino consumers. From the launch of the all-new Ciaz sedan to the introduction of the Super Carry, Suzuki was able to connect to a wider set of audience through a strengthened product portfolio in 2016. This was beefed up by the cross-country Auto Festival, various test drive activities, and participation at the Philippine International Motor Show or PIMS. The year also saw a number of dealership launches in line with the company’s determination to offer greater product and service accessibility to more Filipinos. Among the newly-launched dealerships located in the country’s emerging markets include Suzuki Auto South Cebu, Suzuki Auto Pulilan, Suzuki Malolos Satellite, Suzuki Auto Gen San, Suzuki Auto Quezon Avenue Satellite, Suzuki Auto Sta.Rosa, Suzuki Auto Biñan, Suzuki Auto Baguio, Suzuki Auto Davao, Suzuki Auto SM Gen San Satellite, and Suzuki Auto Batangas. Suzuki was also part of the first-ever Euro 4 Fuel Economy Run organized by the Department of Energy (DOE) in partnership with Petron Corporation. 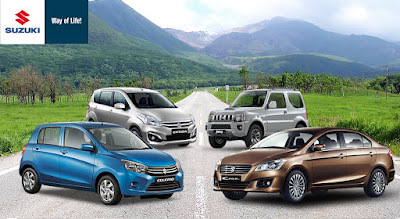 Celerio MT, Ciaz GLX AT, Swift 1.2, Ertiga GLX AT, Celerio, and Ciaz MT were among the 70 vehicles that joined the 280-km run participated by 20 different car manufacturers. And out of all the participating vehicles, Suzuki Celerio CVT emerged to have the best gasoline-powered engine, while the all-new Ciaz Manual Transmission (M/T) topped the fuel-efficiency test in the gasoline sedan category. Aside from Ciaz and Super Carry, other Suzuki cars contributed to SPH’s overall sales growth, too. The Celerio is the largest sales driver with a 149 percent growth YoY. Meanwhile, the Ertiga, Jimny, Swift, and Alto 800 followed each having maintained a double-digit YoY growth. Suzuki should bring in the all new (and now more compact) Vitara to sustain their momentum. They're missing out on the high growth subcompact SUV pie. The Grand Vitara is really antiquated with its 4 speed transmission.